Longest wind turbine blade ever manufactured in India. 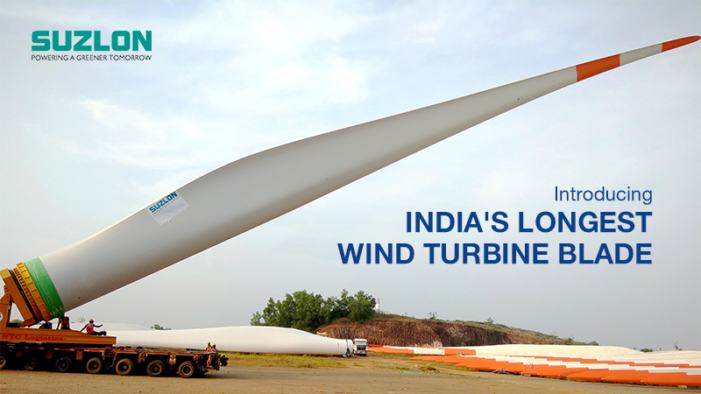 Suzlon Group has outlined and made the nation’s longest wind turbine blade at its Padubidri Rotor Blade Unit. 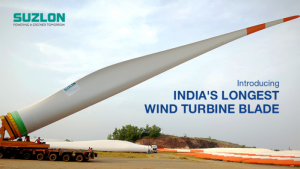 The propelled cutting edge (SB 63) measures 63 meters long and has been particularly created for Suzlon’s new S128 wind turbine family with a rotor breadth of 128 meters, 1.5 times taller than the India Gate landmark as far as tallness. Suzlon’s turbines have been setting industry benchmarks over the innovation esteem chain by conveying worldwide scale ability to India. This cutting edge has been built with a carbon support which gives the capacity to use more slender streamlined profiles and furnishes higher lift with less drag to add to the turbine’s amazing execution in low wind areas. The cutting edge likewise fuses level back innovation at the root that limits drag and spares extra weight and cost. The S128 arrangement offers ~33% more cleared zone (12,860 m2) and is relied upon to convey ~32% more vitality age contrasted with the S111. With an expansion in the cleared territory Suzlon’s cutting edge turbine is very much prepared to enhance vitality yield and bolster focused levy condition in India while ensuring our clients quantifiable profit. These rotor cutting edges will be transported utilizing an inventive two overlap transport framework, which will utilize a specific ‘Connector Trailer’ without precedent for India, which guarantees sheltered and unbound mobility through the bumpy landscape, while transporting the long edges. This imaginative approach will guarantee a sheltered, financially savvy and time productive method of transport for the 63 meters in length rotor edge to the most remote regions.